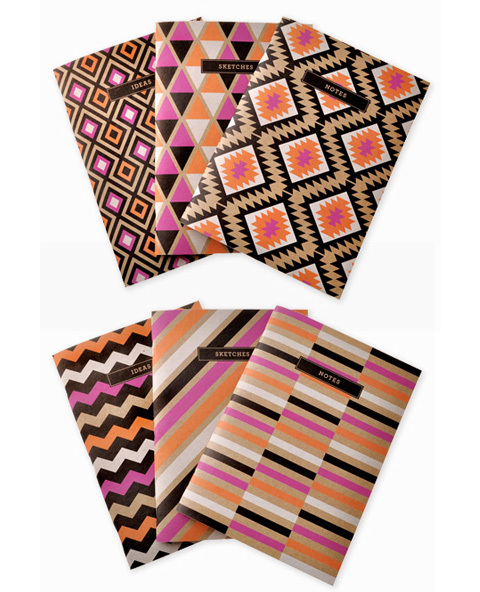 Loving these bold and vibrant notebooks from Inky Co.
Oh dear! So so cool! Adore both the patterns and the colors! hey ! very nice ! I would love drawing inside of them ! Love your notebooks! Any chance you will produce some sort of sketch books with white pages? That would be perfect! Love!!!!!! Thank you for introducing me to this amazing store!! Oooh this is so cool!! One of my favourite bloggers (you!) is getting into spring as well :) I'm an argentinean who is really excited about the upcoming warm season, but reads so many blogs that are already talking about fall..
LOVE your blog, and want to get everything I find in here. These are great! Love the bold colors! I don't think my desk supplies will ever be the same. Thank you for this awesome site, and for everything else you post. Love it. Oh! Love these patterns. Cool find.